I don't feel too bad about this one, though. I detailed how I got this picture in the Arizona page. 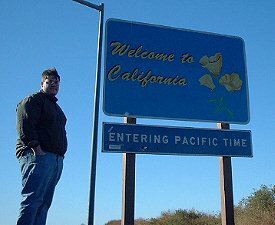 This was the first time I was in California in 11� years. In 1990 we did a southwest trip in which we put about 4,000 miles on a Dodge Caravan. 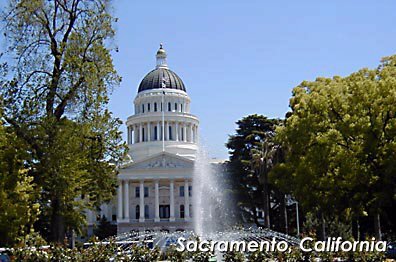 We entered California through Death Valley, stayed at Lone Pine, then down US-395 to the Los Angeles area, up the Pacific Coast Highway to San Francisco with side jaunts to Oakland and Sacramento. When I did the Dallas road trip I remembered wondering, given the different graphical designs of state border crossing markers, how the signage would be when driving across a time zone. The only other occasions I had (been) driven across a time zone was crossing into the Atlantic Time Zone from Maine into the Canadian Maritimes, and on the southwest trip our time zone crossing was Hoover Dam, which was interesting because on the Nevada side of Lake Mead there was a big sign saying "Pacific Time" and a clock reading 1:00, and on the Arizona side there was a big sign saying "Mountain Time" and another clock reading 1:00. This is because Arizona does not celebrate Daylight Saving Time. Anyway, signage on Time Zone lines is fairly typical to the sign shown here: a basic sign simply saying "Enter Pacific Time." Speeding along I-10 towards the California line, it was fairly smooth sailing. About two miles before the border the speed limit drops to 55 and there are some heavy merges and traffic starts to back up. There is the telltale outline of a suspension bridge in the distance. But it turned out that the suspension bridge was not for auto traffic or even a road; it carried only a pipeline. There's a small green sign just simply saying "Welcome to California." When I saw that I started flipping out, incredulous that I had driven 150 miles across the desert only to have a tiny nondescript welcome sign. Cars on the left, trucks on the right. Seeing that I was in a Buick with California plates, I was waved through. Once past the plaza I was relieved when I saw this sign on the side of the road. I almost expected it to say something like, "California: You Made It!" I also remembered that California freeways do not have exit numbers. I think this is being remedied. I also noticed that gasoline was 40� more expensive on this side of the border. I was last in Sacramento in July, 1990. This page loaded in 2.577 milliseconds.